With roofing contracts, health and safety issues are dominated by the risk of working at heights. This concerns not only those on the roof who may fall, but also those underneath who may be injured by falling debris. This is usually dealt with by providing scaffolding. Construction is now the most dangerous industry in the UK. Deaths and serious injuries fluctuate, but as a rule, reported serious incidents and deaths occur at a rate of one per day! The vast majority of these accidents occur as a result of falls from or through roofs. Who knows how many unreported accidents occur. Popular attitudes towards health and safety in the UK today are very inconsistent. It seems that a short term financial saving is often enough to tempt people to compromise their principles and encourage cowboy operators to risk the lives of their employees. Whilst no one would consider employing a chimney sweep who intended to send a small boy up their chimney to do the job, many people turn a blind eye when a roofing contractor sends his workmen to fix their roof without any scaffolding! What is the difference? Ask your contractor to describe exactly what protection they are providing. 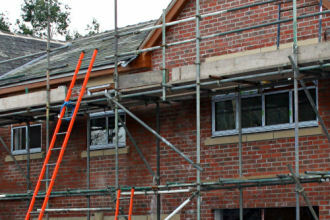 Common short cuts include only scaffolding the front of a building or providing no scaffolding at all. Consequently reputable contractor's prices may seem comparatively higher. Remember that it is your responsibility as a consumer to support good practice. If you do not support cowboys they cannot survive. Homeowners and property managers should consider the risk to themselves, their children and to those, for whom they are responsible, should inadequate protection lead to debris and materials falling and hitting people.